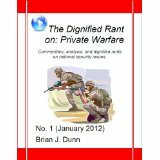 The Dignified Rant On: Private Warfare (No. 1 January 2012) is a collection of posts from my blog, The Dignified Rant, on the issue of mercenaries, privatized warfare, and nonstate actors emerging on the state-centric world stage. It is just 99 cents. This planned series was more work than it justified. A more granular subject index would have been wonderful. I did start another on Iran's nuclear issue but never finished it. I don't rule out doing another one, perhaps in a different style. But I don't have anything on the horizon. I do intend to add some titles here not based on the blog, in time. I hope. If you wish to support The Dignified Rant, buying a copy is an easy and inexpensive way of doing so. And I'd appreciate that.